China's martial arts history originated in the HeNan province of China. Partnering with Henan Media Publications, KungFuDirect has produced this instructional series, breaking down movements and applications of hundreds of different traditional and modern wushu styles. 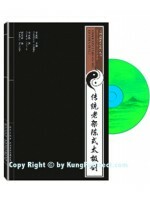 This set includes an instructional book and VCD, both in the Mandarin Chinese and English languages, giving you a wider range of detailed learning methods for your training.